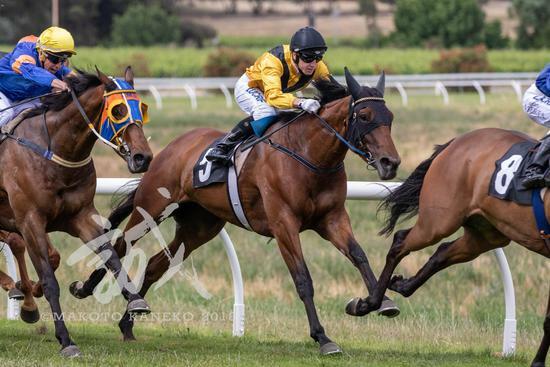 The stable enjoyed a wonderful afternoon’s racing at Clare Valley on Sunday, saddling up two impressive winners. Barbados filly Martinique (3f ex Rainbird Blue) was sent out a short-priced and well-supported favourite in the first race, the 1100m F&M Maiden Plate, and off the back of her good fresh run in town where she was beaten less than four lengths, she was always going to be hard to beat. Jason Holder fired Martinique out of the gates and once she found the front she was virtually untroubled, skipping clear inside the furlong to cruise down to the line, an easy three-and-a-half length winner. The beautiful grey was a $40,000 purchase from the Adelaide Magic Millions in 2017, and if today’s maiden win is anything to go by, then her large group of owners are going to see the winner’s stall again in the near future. Our second runner for the day was our talented Sepoy mare Vahana (4m ex Nandi) who was resuming from an extended break in the fifth of the day, the BM64 over 1100m. Having shown a lot of ability in metropolitan class earlier this year, the aim today was to get her away from our city base and give her a bit of experience on the road, in the aim that it makes her a better racehorse in months to come. Mark reported after the race that the trip away has done her well, with Vahana a pleasure to saddle up and generally on her best behaviour - taking into consideration she was first-up and fresh. Stepping away from the gates a little slowly, Ryan Hurdle had to hunt Vahana up early on, to hold a position behind the leaders. Coming to the turn, she travelled so well that all she needed was a run. That run came turning, when Ryan sent Vahana underneath the leader and she ran away for a rather soft win. Today’s victory was the mare’s second from five starts, and she is going to keep improving with racing, so we can expect many more. Congratulations to Vahana’s owner and breeder Nick House.